Introducing the imageRUNNER ADVANCE 8200 Series, a solution center for digital communications that delivers a simplified, truly integrated workflow. These models streamline every part of the production process to help maximize productivity and improve profitability. From every point of view, these models are simply advanced. Dimension With the Upright Control Panel (To the right edge of the Upright Control Panel in the right-most position): 49-1/4" x 53-3/8" x 30-3/8"
Without the Upright Control Panel: 48" x 25-3/8" x 30-3/8"
Installation Space With the Upright Control Panel: 100-1/4" x 31-7/8"
Without the Upright Control Panel: 79" x 31-7/8"
Paper Size Z-Fold: Letter-R, Legal, 11" x 17"
* The Upright Control Panel is standard on 8205/8295 models, and optional on the 8285 model. ** If "Quick Startup Settings for Main Power" is set to ON, it takes 7 seconds until the key operation on the touch-panel display is available after turning on the main power. -� Standard color scan support is up to 300 dpi. Up to 600 dpi scanning requires Additional Memory Type D (512 MB). 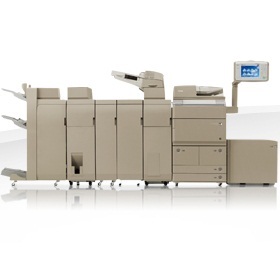 -� -� EPS can be printed directly only from Remote User Interface. -� -� -� XPS cannot be printed directly from the Web Access software. -� -� -� -� Not available at time of launch. Stacking capacity will vary depending on paper type. Coated paper can be loaded from the Document Insertion Unit only. br>When the Auxiliary Tray is extended. Option for Booklet Finisher-Q1 PRO. Installs internally with Inner Staple Finisher-N1 or Booklet Finisher-N1. Installs internally with Booklet Finisher-N1. Requires Staple Finisher-N1, Booklet Finisher-N1, or Booklet Finisher-Q1 PRO. NOTE: Some accessories require additional equipment or may be prerequisites for other options. Some accessories cannot be installed simultaneously. Check with your Canon Authorized Dealer for details.